It takes so long to get here, the build and the workshops take so many weeks, and yet once Faire begins the weekends just fly by. 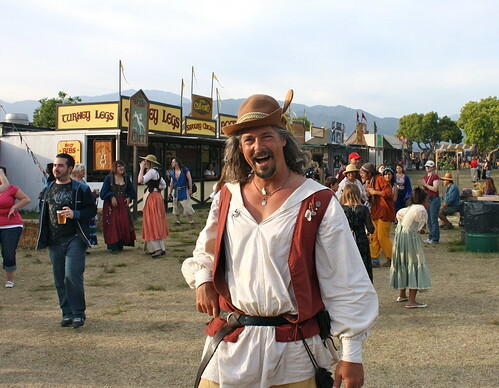 We passed our second weekend mark and the Faire is in full swing. I took some time on Sunday afternoon to do a bit of walkabout with Captain Sexypants, catch a show, and generally see what was what around Port Deptford. This is me, going walkabout. I probably look really happy because I’m looking at the man I love. Or something schmoopy like that. Also, those couched grommets? Yeah, that took forever. It looks pretty cool though, yeah? The costume approval guy said he really liked them. I might have felt a little smug and forgotten that it had taken me almost a week and a lot of swearing and stabbed fingers after he said that. Anyway, I digress. 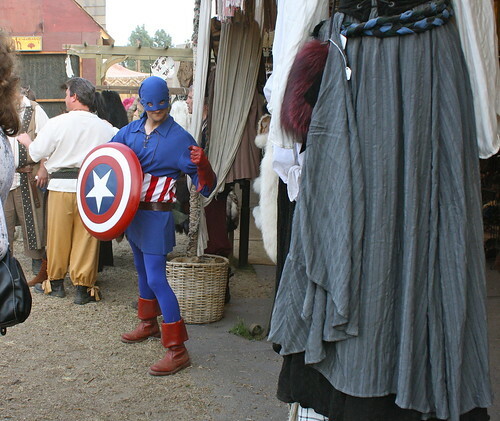 This is Captain Sexypants, on walkabout. 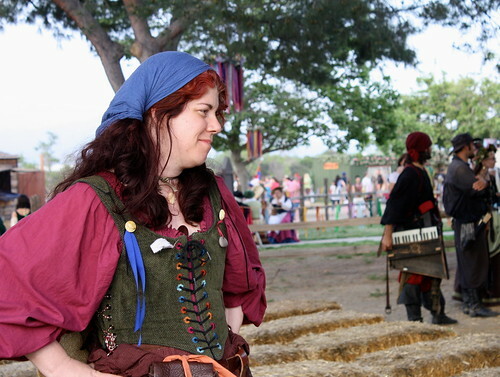 Actually, this is Captain Sexypants, after dancing in the drum circle that was taking place around the feasting commons, but technically we were still on walkabout. And he also looks pretty happy, probably because of some schmoopy reason or another. Like, you know, rrrroooomaaaance. Because it’s like that. 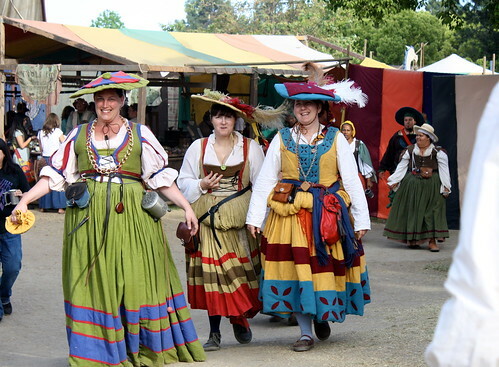 There’s something for everyone at the Faire! I mean, how could you not appreciate that? How could you not want to lick that totally appreciate that? 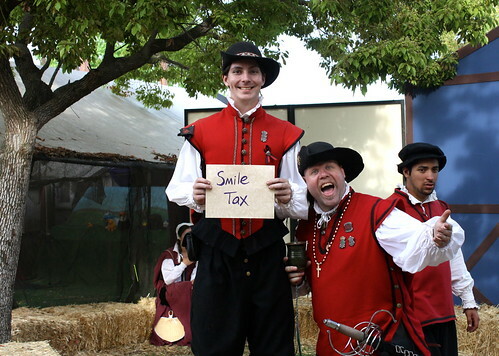 I love the Yeomen of the Queen’s Guard. I love the Germans. They have the best costumes! 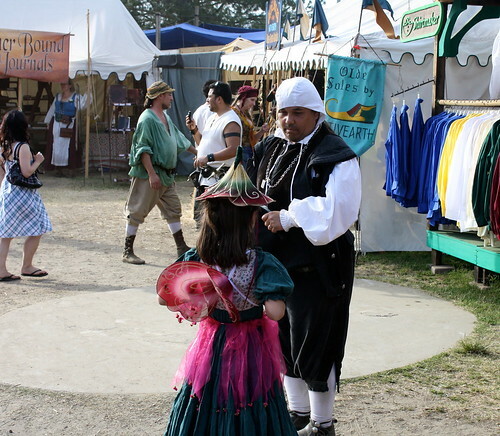 This particular Puritan was seeing fairies. Nobody else could see them. I was seeing superheros. I didn’t ask if anyone else could see him. 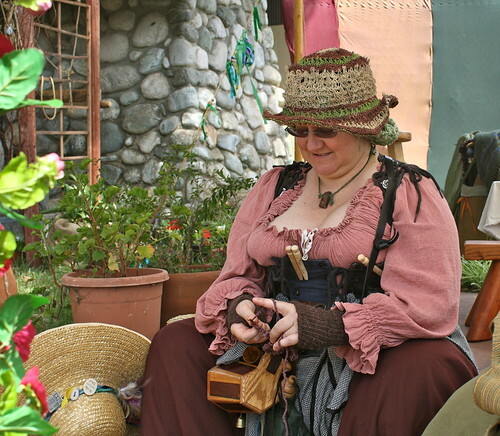 These days at Faire are so fleeting, they go by so fast, and they are so magical. There are times when I’m there and the whole world just narrows down to the sound of bells, of laughter, of music drifting into the guildyard from one stage or another (or two at once, we’re sort of sandwiched between several), of people talking, the commoner’s choir singing, or just the wind in the grass. I treasure it. File it away in little snapshots of sound and color, to take out later and enjoy. 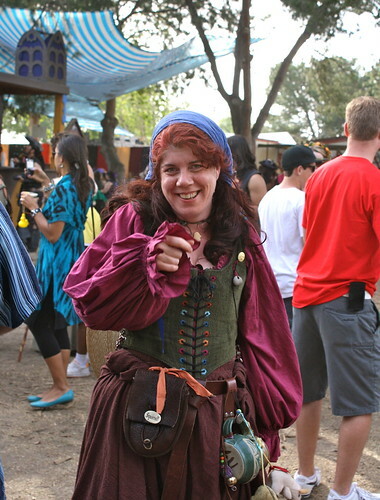 This faire is pretty special in particular, given that I met Captain Sexypants there last year and here it is, another year later and we’re just falling deeper and deeper into something wonderful and rare only now we’re experiencing Faire together and it’s all new and shiny and different because of that. It’s that magical time of year where I get to go home every weekend and hang out with my tribe. It’s a happy, happy time, y’all. 4 Responses to Another weekend, gone. Of course! I’m “on stage” and in character and in full accent from the minute the opening bell rings until sweep goes by at night. It’s a long day. 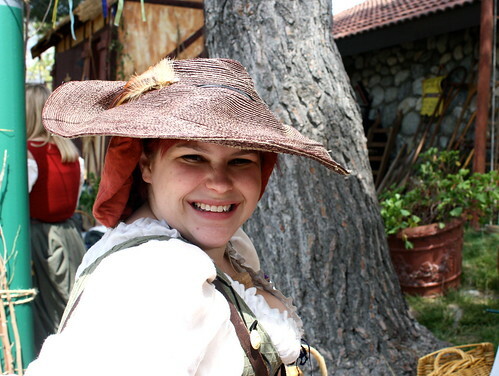 Though when we were going walkabout we just wanted to enjoy the faire, not work, so I wasn’t in accent/character, we pretended to be customers. That dude in black is um… wow. I’d like to totally appreciate him for a while.. that’s for sure!!! You and your Captain look awesome… schmoopy love must suit y’all well! !